TIFFANY CASSIDY (HOST): This is the story of how fire, cows and bison keep the world’s most endangered ecosystem healthy. NATALIE HASSETT: There’s just such a sense of calm and peace out here. DALE GROSS: Try to return some of this history to the landscape. TIFFANY CASSIDY: You’re listening to Nature Talks: the Nature Conservancy of Canada podcast. Fascinating stories about nature, why we need it in our lives, and the passionate Canadians helping to protect it. I’m Tiffany Cassidy. This is episode five: The World’s Most Endangered Ecosystem. TIFFANY CASSIDY: I’m driving down a bumpy gravel road in southwest Saskatchewan. I just passed a sign that says “not an all-weather road.” I last saw another person two hours ago. But I need to travel to remote places to find what I’m looking for. This remote landscape is home to the world’s most endangered ecosystem. TIFFANY CASSIDY: I’m pulling up to Old Man on His Back Prairie and Heritage Conservation Area, a Nature Conservancy of Canada site. Thirteen thousand acres of native grasslands. Open grass…no trees…you might stumble on a cactus in the field. It’s as dry as you can get without being a desert. Rolling hills of grass as far as you can see, meeting the sky. You can’t see or hear signs of any other people. TIFFANY CASSIDY: This is where the Nature Conservancy of Canada’s Natalie Hassett works, managing the land. NATALIE HASSETT: It’s a real special area, I mean there’s no other houses around and it’s definitely, I mean, it’s close to the middle of nowhere. Definitely feels like, yeah, you’re kind of the only one out here. It’s definitely a sense of, yeah, kind of being on your own and being at one with nature. TIFFANY CASSIDY: When we think about endangered ecosystems, we may think of rainforests or coral reefs. But temperate grasslands are actually the world’s most endangered ecosystem. Fifty per cent of the original grasslands across the world are gone. Where we are now, five hours southwest of Regina, is one of the best examples of North America’s remaining native grassland habitats. TIFFANY CASSIDY: We’re walking to explore the site. Many grassland animals — the ones out here — are species at risk. Meaning their numbers have been declining rapidly, and without help may soon disappear. But what’s interesting, is out here they can seem common. The Nature Conservancy of Canada property is a refuge. Even if you can’t always see the animals, you can usually hear them. NATALIE HASSETT: It’s just such a sense of calm and peace out here. But at the same time, you know, when it is silent and you take a minute to listen, you hear the business of the grassland around you as well. Like if it’s a bee buzzing or a bird chirping or whatever. It’s like you’re alone but never really alone. TIFFANY CASSIDY: The late Peter Butala and his wife and acclaimed writer, Sharon Butala, donated a portion of this site in 1996. And one of Peter’s dreams came true in 2003. The Nature Conservancy of Canada re-introduced 50 wild plains bison. Bison are an important part of the ecosystem. TIFFANY CASSIDY: You just need to look around to see how. NATALIE HASSETT: So right down here we have a patch of bison fur that would have snagged on some of this older grass. It kind of comes off in little tufts, or mats, and you can kind of see here that some of the grass has actually been incorporated into this. So as you can see you can kind of pull it apart and whatnot, and that is what a bird would do to make the nest. TIFFANY CASSIDY: So this fur just got ripped off and now it’s here and a bird will probably find this and patch it up with its nest sometime soon. NATALIE HASSETT: Yeah, it’s got excellent kind of thermoregulation properties as well, as it absorbs the moisture, so it’s kind of cool to see that the birds use that. You also find the bison wallows. They like to, of course, scratch and wear away the grassy areas. Water will collect there. And you’ll see the grassland birds drinking from those wallows as well. So yeah it’s kind of cool to see the interactions between the different species. TIFFANY CASSIDY: Bison aren't the only things changing the landscape. For thousands of years, grasslands have evolved with these disturbances. So now, they need them. One of those disturbances? Fire. New research here is looking at how fire and grazing make these grasslands healthier. Both change grasslands to make it a better habitat for the species that live here. DALE GROSS: Because they occurred for thousands of years and they will occur for thousands of years more, that species have become adapted to. If you don’t have those conditions, they don’t have the habitat they require, they don’t persist. TIFFANY CASSIDY: That’s Dale Gross. He’s leading up this research. In the past, fire would ignite across the prairies through lightning strikes. Indigenous peoples would also light fire as a way of attracting bison. The bison would come to the spot to eat the new regrowth of plants. Now, scientists need to light fires to mimic the disturbances that happened for thousands of years. It’s called a prescribed burn: intentionally burning the grass. And it’s more than just dropping a match. It takes months of preparation and is only done when conditions are just right. TIFFANY CASSIDY: We’re at the prescribed burn at the Nature Conservancy of Canada’s Old Man on His Back. More than 20 people are here, helping out Dale and his research team. They’re just getting started. By then end they will have burned 30 acres — the size of almost 80 NHL hockey rinks. Dale and the crew are preparing with shovels, water jugs and everything needed to control the fire. TIFFANY CASSIDY: They carefully run a torch along the grass. They connect the ends of the fire in a triangle pattern to cut it off. And the fire burns towards itself. TIFFANY CASSIDY: The whole prescribed burn will take three days. They’re doing it slowly; only when the wind, temperature and humidity levels make it safe. It might seem unusual or even shocking that conservationists are burning plants. But it’s necessary for the health of grasslands. TIFFANY CASSIDY: Fire is great at removing the dead grass above the ground. DALE GROSS: It’s so common to think of grass as what we see. They’re icebergs. Most of what a grass plant or a prairie plant is 70 per cent of it is underground. But they’re resistant, resilient to these type of disturbances, because they’ve evolved with them for thousands of years. TIFFANY CASSIDY: With grasslands, you have to use your imagination to see the whole thing. These roots underground hold carbon that they pull from air. The nutrients of this fire will feed them to regrow healthier plants. Soon plants will grow where right now there are flames. Bison or cattle will be attracted to this fresh food. And they’ll drop manure there. Dumping nutrients into this soil. TIFFANY CASSIDY: And then when rains come and then cattle come and stomp through there, those nutrients are incorporated into the soil, to be taken up eventually by the plants themselves in their roots, to re-grow again. There’s a feedback that is important to understand and they happen because this has always happened. Fire and cattle work together to keep the land healthy. TIFFANY CASSIDY: On most grasslands in North America, cattle have replaced bison as the grazers keeping the land healthy. TIFFANY CASSIDY: Dale wants to see whether ranchers can make cows graze even more like bison. He and master's student Hannah Hilger have collared some of these cows and bison with tracking devices to follow their grazing patterns. Dale’s tracking them to see what moves them to different grass. A couple days pass at the burn patch and Dale confirms what he thought would happen. Curious animals are coming to check out the area. Pronghorn, an animal that looks like an antelope, come by. When cattle are put back onto this pasture in a couple months, we’ll see if they are also attracted to the burn patch. Dale’s doing this work for a purpose. DALE GROSS: To try to return some of this history. History. To the landscape. Because it is a necessary part of how you maintain a variety of species in their habitats. TIFFANY CASSIDY: Healthy grasslands are a refuge for lots of grassland animals. But they’ve also become a refuge for an endangered animal you wouldn’t expect…That’s after the break. TIFFANY CASSIDY: The Nature Conservancy of Canada is a national charity. 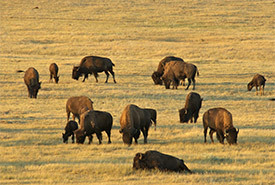 We protect important natural areas for the species that need them – species from bison, to humans. How much do you know about Canada’s grasslands? Test your knowledge and learn about how we’re protecting them at natureconservancy.ca/podcast. That’s nature c-o-n-s-e-r-v-a-n-c-y.ca. TIFFANY CASSIDY: Keeping these grasslands healthy means a lot for the animals that have been there for thousands of years. But like all ecosystems, this one is changing. JOE POISSANT: They roost in cavities. And if you imagine the prairie, it’s not really somewhere that’s — I should say tree cavities — but the prairie just isn’t somewhere that trees would exist. If you had a drone and you flew straight up from OMB [Old Man on His Back] and you looked around, there’s just nothing but grass. So to have these bats, it’s just it’s really cool for the species. TIFFANY CASSIDY: Joe records the sounds of bat with his Anabat. And he shows me how he sets it up. JOE POISSANT: When I get to where I’m going, I have a pelican waterproof case. And I’ll to set it up basically I have my Anabat, which is a little box with a microphone on it. The way the Anabat works is it will capture the bat’s call and slows it down. So bats, basically their calls start at about 20 khz, which is just at the upper range of human hearing. So if you’re at a cave you might hear a really faint click of a bat. That’s the low end of its call. So the Anabat records the call and slows it down and makes it into a sound that we can perceive and hear. So I can turn the Anabat on, and you can hear. If you rub your fingers together, you can kind of hear a faint hiss. [RUBS FINGERS] But if you use the Anabat, what happens is [ANABAT SOUND]. That’s ultrasonic sound that my fingers are making that we can’t hear. TIFFANY CASSIDY: When Joe left this overnight at Old Man on His Back, here’s what he heard. TIFFANY CASSIDY: The little brown bat. Joe thinks it must be roosting in structures like old brick buildings, hibernating at a few degrees Celsius. And here’s why that’s exciting: in 2006 researchers discovered one of the biggest threats to bats. A disease introduced from Europe, a fungus called white-nose syndrome. JOE POISSANT: Somebody was doing some bat surveys in the winter and they found thousands of dead bats at the cave in New York State. And after doing some research they discovered there’s a fungus that was actually growing on their tissue. And it just started killing them off and it just started spreading through eastern North America. As bats were moving in the summer and just sort of overlapping their ranges and breeding. TIFFANY CASSIDY: This fungus is affecting bat populations across half the continent. The fungus grows on their faces and exposed skin while they are hibernating, turning their noses white. JOE POISSANT: If you imagine a bat, it’s basically, in the winter it’s a battery. It has a certain amount of fat store. And what happens with white-nose is that it makes the bat wake up. And every time a bat wakes up, it burns body fat. And it has a limited amount of body fat. And once it runs out, there’s no insects for them to feed on in the winter, and to build more fat and they end up dying. TIFFANY CASSIDY: This likely isn’t the historical range of the little brown bat. But if Joe’s recordings prove they are here, then they must be hibernating here because little brown bats don’t migrate far. It raises the possibility that the protected grasslands at OMB may be a refuge for bats from white-nose syndrome. JOE POISSANT: The fact that they exist in the prairies, and it’s a place where in a lot of cases parasites and fungus, they can’t survive because it’s so dry, it gives these bats the ability to probably persist long-term and not be affected by the white-nose. TIFFANY CASSIDY: Finding little brown bats on the grasslands shows their ability to adapt. And their ability to survive will have ripple effects on biodiversity as a whole. The Nature Conservancy of Canada and passionate volunteers are starting to build bat boxes out at Old Man on His Back. The hope is that long term — in five to 10 years — bats will start roosting in them, making the prairies an even better refuge. For animals you would expect, animals you might not expect and animals you can’t always see but can often hear. TIFFANY CASSIDY: The Nature Conservancy of Canada does amazing things — like returning bison to their native grasslands and protecting some of the world’s most endangered ecosystem. This work is only possible because generous people like you donate. If you would like to support this work, go to natureconservancy.ca/podcast and click on the big orange donate button. All amounts make a difference. TIFFANY CASSIDY: Like what you heard on our podcast? Subscribe to future episodes on your favourite app. Give us a tweet [BIRD TWEET] using the hashtag #NatureTalksPodcast. Share it with a friend. Or email us at podcast@natureconservancy.ca. And if you looking to explore the amazing places we talk about on this podcast, go to natureconservancy.ca/podcast to see our sites that you can visit. Next time we’re staying on the grasslands…But learning about a much, much smaller species. One that you’ve probably never seen, considering there are fewer than 500 individuals left in the world. The Nature Conservancy of Canada is trying to save it from extinction. Thanks to Dale Gross and Joe Poissant for sharing their stories and research with us. Thanks to Natalie Hassett for her expertise, and everyone at the Nature Conservancy of Canada who put this podcast together. And thanks to Pop Up podcasting. Some of the birds you heard were from the Macaulay Library at the Cornell Lab of Ornithology, from recordists Wil Hershberger and Geoffrey A. Keller. Our theme music is by Carly Dow – NCC staffer/musician. She’s at carlydowmusic.com. I’m Tiffany Cassidy. Thanks for listening.